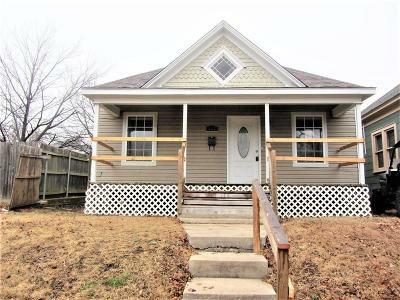 Nice home near downtown that has had some previous updating. There is a fenced backyard, big covered front porch, and central heat and air. Inside there is a spacious living/dining room combination, a nice kitchen, laundry room, and 3 bedrooms all with newer finishes like laminate flooring and ceramic tile. Owner Occupant purchasers utilizing FHA insured financing (including the FHA 203(k) Rehabilitation Program) could get this home for as little as $100 down. Buyer(s) to verify all information at their own expense including taxes, school districts, property condition and property lines. HUD homes are sold in as-is condition. Buyer inspections are for information only. No repairs will be made by any party for any reason prior to closing. Exempt from disclosures/disclaimers. Listing office does not have any information on property condition, title history, or any needed repairs.